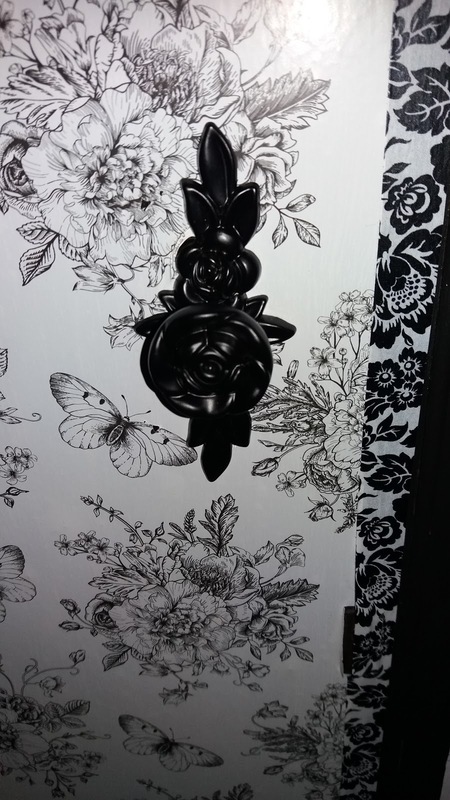 Tales From A Geordie Goth : Upcyling With Sticky Back Plastic. 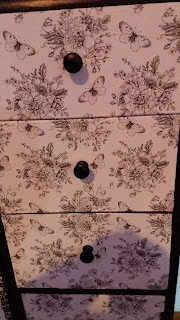 For a while, I was searching for a wardrobe and somewhere to store my fabric for my guest bedroom, so a couple of months ago. 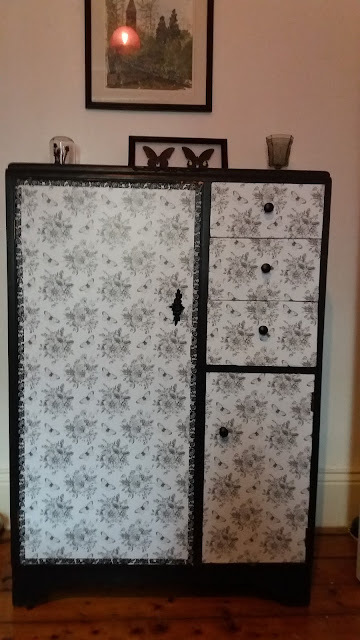 I found a small wardrobe at a local community shop it cost £25. It fit the bill perfectly and was already painted black. 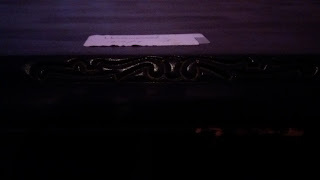 I love the small inlay detail it looked lovely. I felt it was boring and need some excitement, so I purchased some sticky back plastic from Lidl for £2.50. 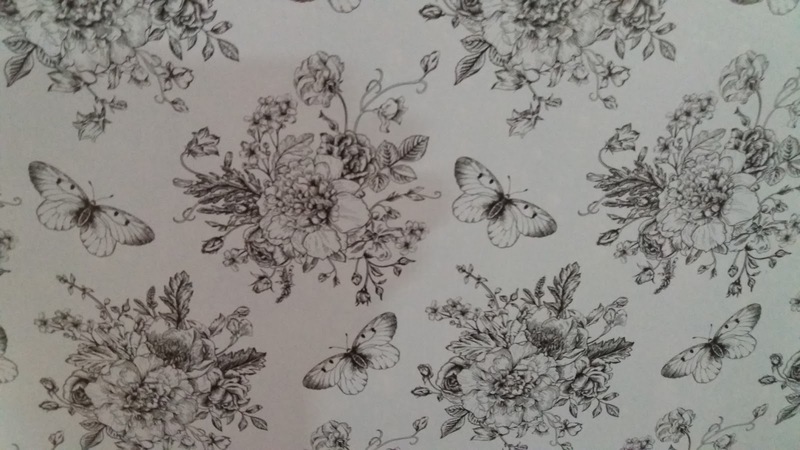 I bought this because it was cheap but I loved the black and white floral print with butterflies. I decided to use it to decorate the doors. I rolled the full roll slowly applied to the door, I removed the backing and wiped with a cloth to prevent the sticky back plastic from puckering. For the drawers I measured and cut the plastic to size, I neatened the edges with a Stanley knife. On the large door, there was a small gap, and I used decorative tape around the edges. I'm not sure whether to use the decorative tape on the drawers and the other cupboard. For the large door, I used a floral handle. 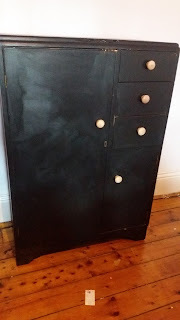 I used small metal knobs from Ikea. I purchased last year, I think Ikea has ceased producing them. 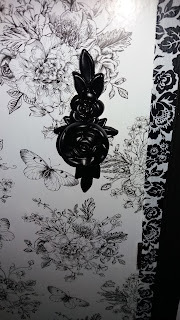 I really like the effect it looks amazing and it suits the decor in my guest bedroom. What a find! 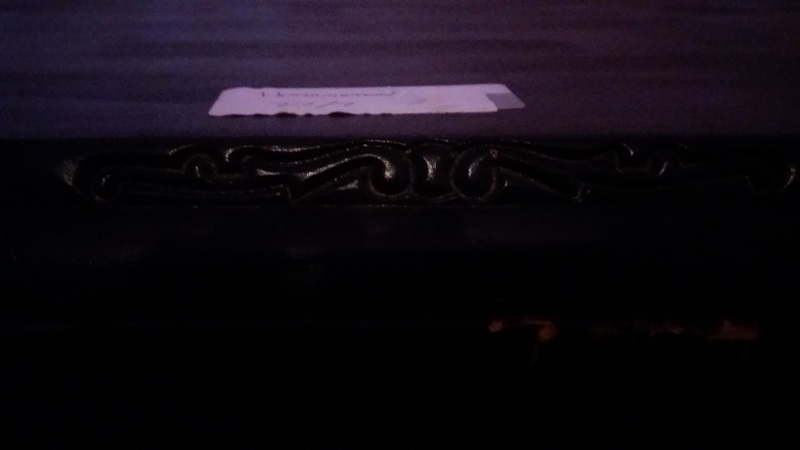 I have several such vintage pieces in my house, but I love how you made it "yours" with those details. Lovely. Thanks.It was a second hand find from local community shop. The handle I had lying about it, until I found and I thought it would work well with the design. Thanks. 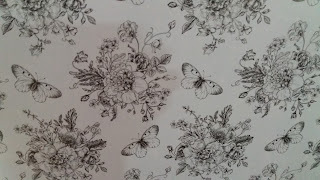 I have sort butterfly and fairy theme going on in my guest bedroom. Well done! It looks really cool. :) I wish I had room for a wardrobe; I love the overall design of them. Thank you. I loved its small size for the guest room. And its great for storing my food. Thanks. I can't believe what a bit of sticky back plastic can do. Wow - looks great. What a make over. Thank, even I can't believe the difference. Love!!! Sarah, I love the way you can turn things around and make them yours!!! Big Hugs! So beautiful! Great find indeed and I love diy like this! Thanks. I love easy Diy projects.